I recently received a selection of DRK stamping plates to review, and tonight I have the first mani that I have created with the DRK Seasons plate. I've also got my first thoughts on the clear jelly stamper which I used for this mani. Let's talk about this plate. I love it. Firstly it is huge, secondly is it jam packed full of unique designs and thirdly, the theme of this plate is so clever. 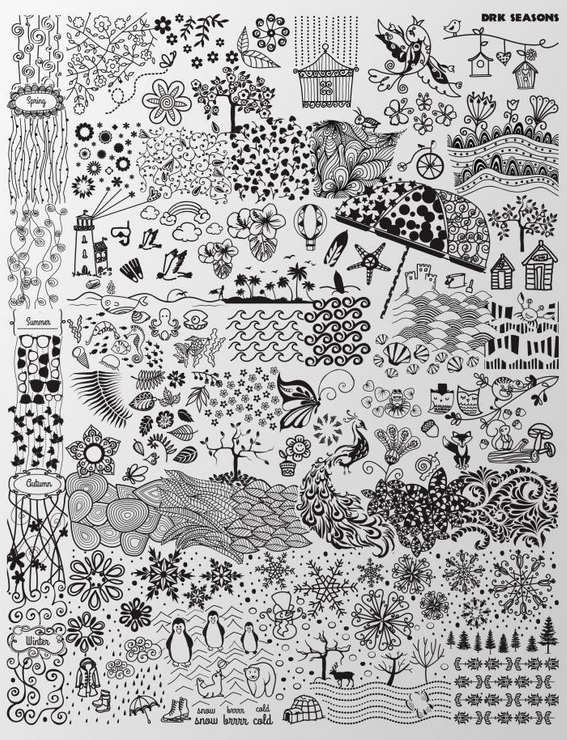 You have stamping images to suit the whole year round. The quality of the plate is awesome too. I have DRK XL 1 and 2 plates that I got several years ago, and this one is just as good. The etching is deep and sharp and all the images I've tested so far have picked up beautifully. 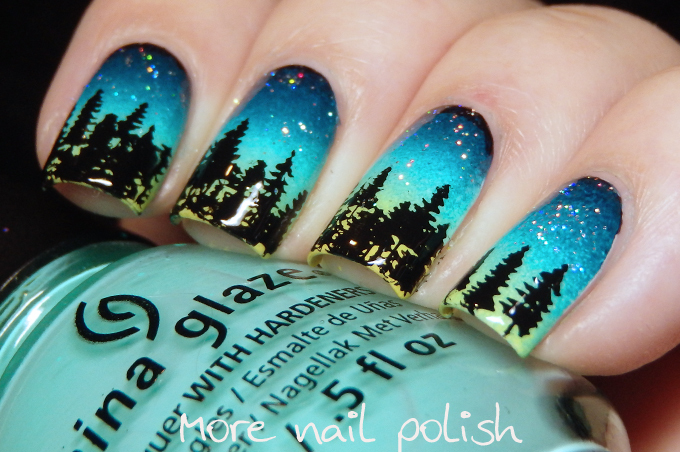 Despite the fact that Summer starts here in 3 days, I went with a design from the winter section of the plate. That little selection of pine trees in the bottom right to be exact. You can see how nicely etched the plate is in this photo of mine. Let's look at my nails next. I created a gradient using Ulta3 Honolulu and Midnight, and China Glaze Highlight of my Summer. 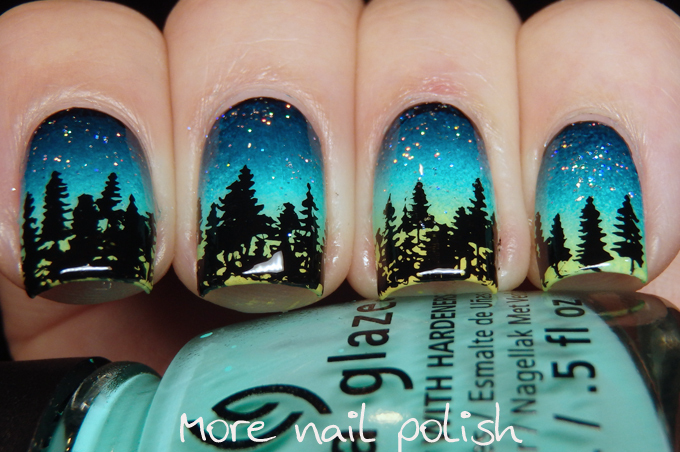 I sponged on a tiny bit of Kester Place Milky Way, which is a fine holo glitter, for the stars. Man I just love it when polishes names match up to the purpose you use them for in nail art. 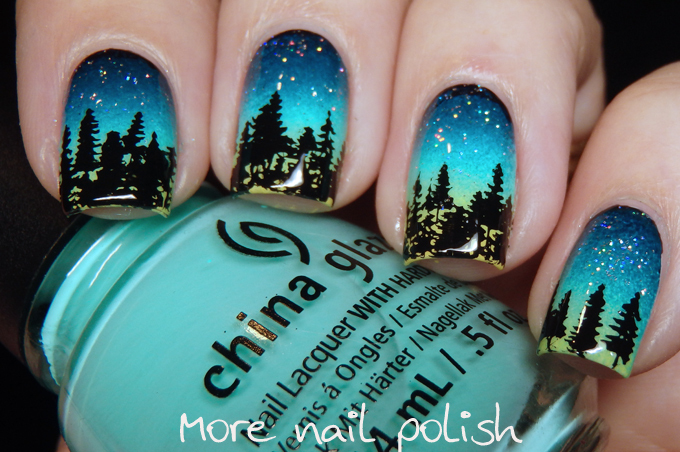 This one had Midnight and Milkyway for a starry night scene. I geek out at that sort of thing. 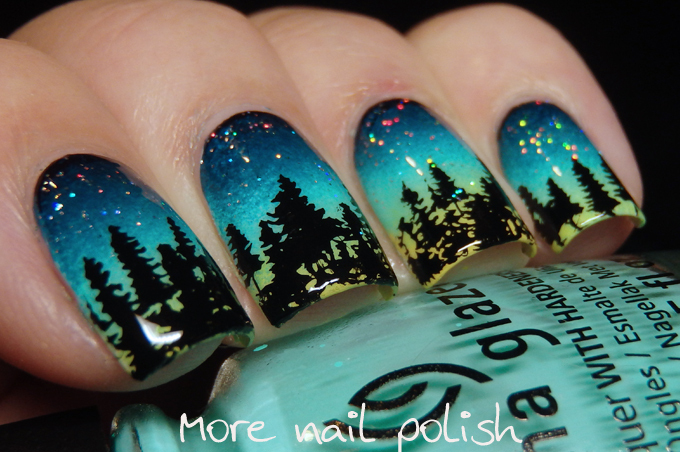 After top coating my gradient, I used my clear jelly stamper to place the black trees. I then finished it off with a coat of SuperChic Lacquer Marvel Top Coat. 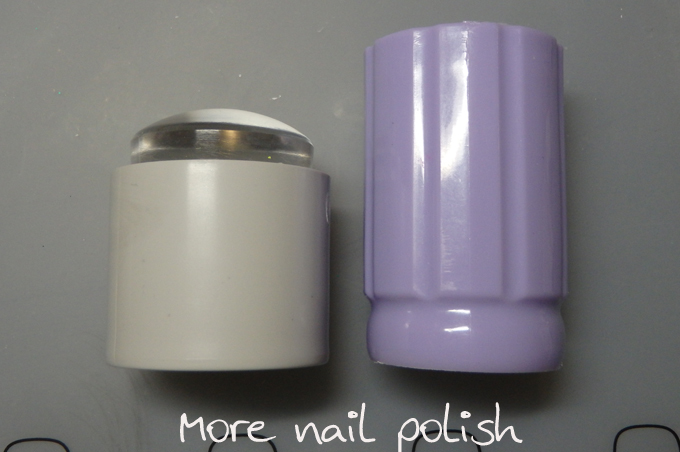 Next is a quick review on the clear jelly stamper. I will talk more about this in another post, but seeing as I used it for this mani I though I would mention it here. The holder that comes with the stamper is the purple one. I found this a bit too long to have to look through. Instead I grabbed this plastic coupling piece from Bunnings. I got three on them in a bag for 35 cents. It's the perfect width and much shorter, so it made placing the images easier. Now about the stamper. It's a bit tricky. I have to say I had terrible trouble using the layered Jelly Stamper plate that I also purchased, that plate appears to be etched too shallow and is faulty, but I'll talk about that another day. I had much better luck with the DRK plate, in fact it worked really well. I think that because the DRK plate is etched so nicely that this stamper works well. Crazy beautiful! I live in the PNW in the US and that's pretty much winter sunsets. You nailed it! I hope someone comes out with a better version of that stamper. I haven't heard a lot of good reviews. It'd be awesome if it was squishy! Beautiful mani by the way. It looks like a photo! I am in love with the manicure you created <3 A clear jelly stamper sounds like a brilliant idea, but too bad it is such a pain to use. Hopefully they'll come out with an improved version any time soon. How awesome is this design? *_* I'm so gonna recreate this some day! 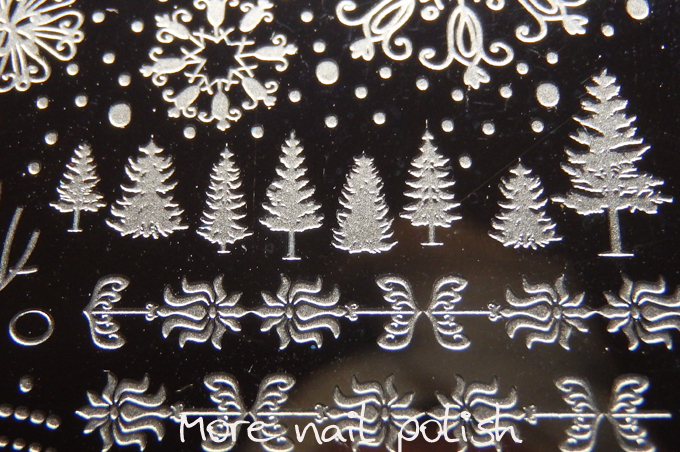 The plate is a little too kiddy for my taste, but the bottom with the trees and snowflakes are awesome. Love what you did with it. Isn't the clear stamper around $22? A little too steep for me, but I'll eventually need to buy it because I'm terrible at placing images. I'm so in love with this! I've been wanting to do something similar lately but after seeing your perfection I probably shouldn't even try! Love love love!